Paulo Linhares and his wife, Carmen Linhares, are instructors in the Brazilian martial art of capoeira. 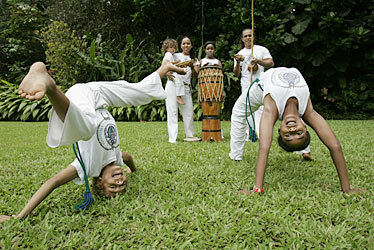 Their children, Isabella, 2, Joao Pedro, 10, Hebee, 11, and Soukaina, 12, are also involved in capoeira. Here, Joao Pedro, left, and Hebee demonstrate one of the dance moves, as Paulo and Carmen Linhares (holding Isabella) and Soukaina look on. Paulo Linhares' father wanted to insulate his 7-year-old from the dangers of their rough neighborhood in Rio de Janeiro, so he sent his son to a master of the Brazilian martial art of capoeira. "My father thought if I'm doing sport, I wouldn't think about doing drugs or things bad," said the now-37-year-old Linhares, who resides in Kaneohe. Linhares, who has become a capoeira "mestre" (Portuguese for master) and father himself, finds that the martial art keeps his family together. "You can enjoy together, learn together," he said. "For me it's very important when the family does things together." The lives of Linhares, his wife, Carmen, and their four children, ranging from ages 2 to 12, are entwined with capoeira and with each other. The couple opened up a school, Capoeira Besouro Hawaii, three years ago. "We literally started with our children," said Carmen, also 37. She must balance raising a family, working full time as a registered nurse-midwife at Tripler Army Medical Center, and helping to run the school. "What I love about our family business, so to speak, is that it allows me to be together with them," she said. "It's the tie that binds us together. "Pretty much, capoeira is our life." Parties and holidays are often spent with the students and their families and, wherever they go, they perform together, she said. "Us being a family has attracted families to capoeira," she said. "Grandmother, daughter, grandson, husband, wife and kids." A martial art with West African roots, capoeira combines rhythmic music with dance and gymnastics-style moves, along with sweeping karate-type leg movements. Capoeira employs musical instruments such as the atabaque (drum), pandeiro (tambourine) and a bowed instrument called the berimbao. Linhares, known to his students as Mestre Kinha, and his wife instruct their children along with 150 students from ages 1 1/2 to 55. "I think capoeira is different from other martial arts," he said. "It's not you win or lose. You enjoy." The actual movements bring smiles to their children's faces, from 2-year-old Isabella, who loves the ponte (bridge pose), to 12-year-old Soukaina, who displays amazing flexibility in ponte. Mestre Kinha said teaching capoeira allows him to share his Brazilian culture and music, Portuguese language, along with respect for elders and others, and balance. "Balance for your life, for your job. It's anti-stress. You enjoy." Linhares learned to fight, but capoeira also taught him control, and he believes it's taught him to be a better father, as his children can attest. "I think it's cool because we go places together," said son Joao Pedro, 10. "If there's a capoeira event, we usually travel to those places." Those places include cities on the mainland, Brazil and Europe. Daughter Hebee, 11, said the family traveled to Switzerland in June to visit the Swiss side of her mom's family. "We went to a family reunion and did capoeira, and everyone loved it," she said. There was a point, however, when daughter Soukaina grew tired of capoeira, having started at age 7. "After not doing it for a year, I realized it was my social life," she said. "I didn't really appreciate it until it was gone."